the human history of the Americas. in the sea that still bears their name. The presence of pineapples on the Caribbean Islands was not a natural event... but rather the result of centuries of Indian migration and commerce. Accomplished dugout canoe navigators, the maritime tribes explored, raided and traded across a vast expanse of tropical oceans, seas and river systems. The herbaceous plant they called "Anana" or "Excellent Fruit" originally evolved in the inland areas of what is now Brazil and Paraguay and was widely transplanted and cultivated. Highly regarded for its intense sweetness, the "Excellent Fruit" was a staple of the Indian feasts and tribal rites related to tribal affirmation. It was also used to produce Indian Wine. The first encounter between a European and the Pineapple occured in November, 1493, when Columbus... on his second voyage to the Caribbean region, dropped anchor in a cove off the lush volcanic island of Guadaloupe and went ashore to inspect a deserted Carib village. There, among the parrot infested jungle and wood pillars of hand carved serpent totems... his crew came across huge cook-pots filled with human body parts. Nearby, were piles of freshly gathered vegetables and fruits, including Pineapples. The European ate and enjoyed the new fruit they had found and, recorded in their journals the new and curious fruit that had such an abrasive... rough segmented exterior, like a pine cone, and a firm... sweet interior pulp, like an Apple. The Renaissance Europe to which Columbus returned with his discoveries was a civilization in great need of common sweets. Sugar... refined from cane was a rare commodity imported at great cost from the middle east and orient. Fresh fruit was also a rare item... orchard-grown fruit being available in only very limited varieties and for brief periods of time. In such a gastronomic culture, reports... and later samples of the New World's Pineapple, whose ripe yellow pulp literally exploded with natural sweetness when chewed, made the fruit an item of celebrity and curiosity for the Royal Gourmet and horticulturist alike. Despite enormous efforts by European Gardeners, it was nearly two centuries before they were able to perfect a hot- house method for growing a Pineapple plant. Thus... into the 1600s, the Pineapple remained so uncommon and coveted a commodity, that King Charles II of England posed for an official portrait in an act then symbolic of royal privilege... receiving a Pineapple as a Royal Gift. Creative food display... the main entertainment during a formal home visit... was a means by which a woman declared both her personality and her family's status. Within the bounds of their family's means, hostesses sought to outdo each other in the creation of memorable, fantasy-like dining room scenes. At such feasts, tabletops resembled small mountain ranges of tiered, pyramided and pedestaled foodstuffs often drizzled and webbed in sugar... studded with china figurines, festooned with flowers and interwoven with garlands of pine and laurel. Dinners were extravaganzas of visual delights, novel tastes, new discoveries and congenial conversation that went on for hours. Dried... Candied and Jellied... were the major attractions of the community's appetite and dining practices and, the Pineapple was the true celebrity. Its rarity, expense, reputation and striking visual attractiveness made it the ultimate exotic fruit. It was the Pineapple that came to literally crown the most important feasts... often held aloft on special pedestals as the pinnacle of the table's central food mound. Ships brought in preserved pineapples from Caribbean islands as expensive sweetmeats... pineapple chunks candied, glazed and packed in sugar. The actual whole fruit was even more expensive and difficult to obtain. Wooden ship travel in the tropics was hot... humid and slow, more often than not rotting the pineapple cargoes before they could be landed. Only the fastest ships and best of weather conditions could deliver ripe, wholesome pineapples to the confectionery shops of cities such as Boston, Philadelphia, Annoplis and Williamsburg. A hostesses's ability to have a pineapple for an important dining event said as much about her rank as it did about her resourcefulness... given that the street trade in available fresh pineapples could be as brisk as it was bitchey. So sought after were the prickly fruits, that colonial confectioners sometimes rented them to households by the day. Later, that same fruit was sold to other, more affluent clients who actually got to eat it. As one might have imagined, hostesses would have gone to great lengths to hide the fact that the pineapple that was the visual apogee of their table display... and a central topic of their guests conversation was only rented. In larger, well to do homes... the dining room doors were kept closed to heighten visitor's suspense about the table being readied on the other side. At the appointed moment... and with the maximun amount of pomp and drama, the doors were opened to reveal the evening's main event. Visitors, when confronted with pineapple-topped food displays, felt particularly honored by a hostess who obviously spared no expense to ensure her guest's dining pleasure. In this manner, the fruit which was the visual keystone of the feast naturally came to symbolize the high spirits of the social events themselves... the image of the pineapple coming to express the sense of welcome, good cheer... human warmth and family affection inherent to such gracious home gatherings. It is hardly surprising that this communal symbol of friendship and hospitality also became a favorite motif of architects, artisans and craftsman throughout the colonies. They announced the hospitality of a mansion with carved wood or molded mortar pineapples on its main gateposts. They incorporated huge copper and brass pineapples in the weather vanes of their most important public buildings. They sculpted pineapples into door lintels... stenciled pineapples on walls and canvas mats... wove pineapples into tablecloths, napkins, carpets and draperies... and cast pineapples into metal hot plates. There were whole pineapples carved of wood... pineapples executed in the finest china kilns and even painted onto the backs of chairs and the tops of desks. Whimsical pineapple shapes and interpretations became a form for "Fun" food creations and general table decorations throughout the 1700 and 1800s. There were pineapple-shaped cakes, pineapple-shaped gelatine molds, candies pressed out like small pineapples... molded in the form of gum and sugar, pineapples made of creamed ice... cookies cut like pineapples and shapes created by arrangements of other fruits. There were also ceramic bowls formed like the pineapple... fruit and sweet trays incorporating pineapple designs, and pineapple pitchers, cups and even candlebras. During the last century, the art of food display centered around the pineapple has faded to a quaint craft now largely associated with the making of certain kinds of Christmas decorations. These holiday fabrications are one of the last vestiges of an era when all life literally revolved around the dining room table. A less complitated era that left us the enduring icon of the Colonial Pineapple. A truly American fruit symbolizing our founding society's abiding commitment to hospitality as well as its fondest memories of families... friends and good times. Origin: The pineapple is native to southern Brazil and Paraguay where wild relatives occur. It was spread by Indians up through South and Central America to the West Indies before Columbus arrived. In 1493 Columbus found the fruit on the island of Guadaloupe and took it back to Spain and it was spread around the world on sailing ships that carried it for protection against scurvy. The Spanish ontroduced it into the Philippines and may have taken it to Hawaii and Guam early in the 16th Century. The pineapple reached England in 1660 and began to be grown in greenhouses around 1720. Adaptation: The Pineapple is a tropical or near-tropical plant, but will tolerate brief exposures to 28 degress F. Prolonged temperatures just above freezing retards growth, delays maturity and causes the fruit to become more acidic. Pineapples are drought-tolerant and will produce fruit under yearly precipitation rates ranging from 25 to 150 inches a year, depending on cultivar, location and degree of atmospheric humidity. They are successfully grown in southern Florida and costal areas of southern Calofornia. The small plant adapts well to container and greenhouse culture and makes an interesting potted plant. 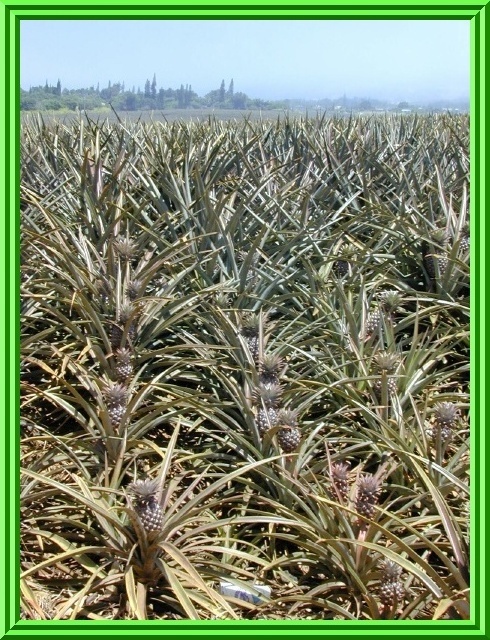 Growth Habit: The pineapple plant is a herbaceous perennial, 2-1/2 to 5ft. high with a spread of 3 to 4 ft. It is essentially a short, stout stem with a rosette of waxy, straplike leaves. Foliage: The long-pointed leaves are 20 to 72 in. in length, usually needle tiped and generally bearing sharp, upcurved spines on the margins. They may be all green or striped with red, yellow or ivory down the middle or near the leaf margins. As the stem continues to grow, it acquires at its apex a compact tuft of stiff, short leaves called the crown. Occasionally a plant may bear 2 or more heads instead of the normal one. Flowers: At blooming time, the stem elongates and enlarges near the apex and puts out an inflorescence of small purple or red flowers. The flowers are pollinated by humming-birds and these flowers usually develop small, hard seeds. 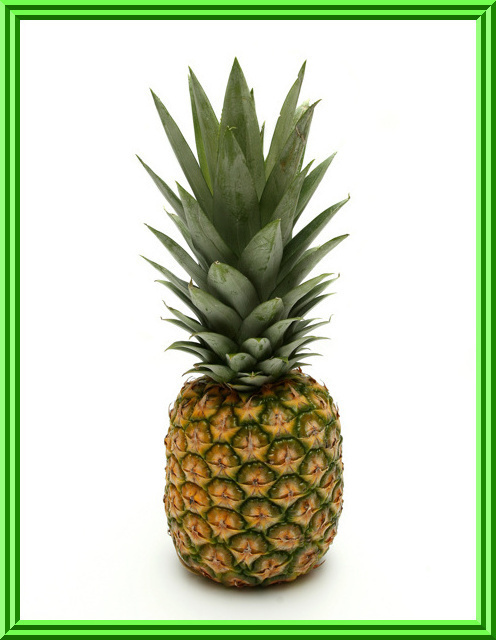 Seeds are generally not found in commercially grown pineapples. Fruit: The oval to cylindrical-shaped, compound fruit develops from many small fruits fused together. It is both juicy and fleshy with the stem serving as the fibrous core. The tough, waxy rind may be dark green, yellow, orange-yellow or reddish when the fruit is ripe. The flesh ranges from nearly white to yellow... in size, the fruits are up to 12 in. long and weigh 1 to 10 pounds or more. Location: Pineapples should be planted where the temperature remains warmest, such as the south side of a home... or in a sunny portion of the garden. Soil: The best soil for the pineapple is a friable, well-drained sandy loam with a high organic content. The pH should be within a range of 4.5 to 6.5. Soils that are not acidic can be treated with sulfur to achieve the desired level. 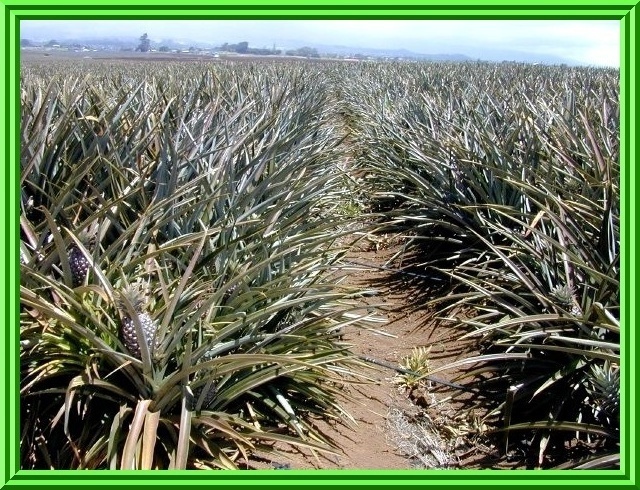 Pineapples cannot stand waterlogging and if there is an impervious sub-soil, the drainage needs to be improved. Irrigation: The plant is surprisingly drought tolerant... but adequate soil moisture is necessary for good fruit production. Fertilization: Nitrogen is essential to increase fruit size and total yield, which should be added every four months. Spraying with a urea solution is another way to supply nitrogen. Fruit weight has also been increased by the addition of magnesium. Of the minor elements, iron is the most important, especially in high pH soils. Iron may be supplied by foliar sprays of ferrous sulfates. Frost Protection: Pineapple plants require a frost-free environment. They are small enough to be easily covered when frost threatens, but cold weather adversely affects the fruit quality. Although slips and suckers are prefered, crowns are the main planting material of home gardeners. These are obtained from store-bought fruit and are removed from the fruit by twisting the crown until it comes free. Although the crown may be quartered to produce four slips, in California's marginal conditions, its best not to cut or divide the crown. The bottom leaves are removed and the crown is left to dry for two days to harden off, then planted or started in water. Pineapples are planted outside during the summer months. A ground cover of black plastic works very well for pineapples, both as protection from weeds and for the extra heat it seems to absorb. It also helps to conserve moisture. Traditionally, plants are spaced 12 inches apart. Set crowns about 2 inches deep... suckers and slips, 3 to 4 inches deep. Pests and Diseases: Mealybugs spread by ants can be a real problem. Controling the ants will control the mealybugs. In most commercial growing areas, nematodes, mites and beetles can also be very damaging... but these have not been a problem in California. Harvest: It is difficult to tell when a pineapple is ready to be harvested. Some people judge ripeness and quality by snapping a finger against the side of the fruit. A good ripe pineapple has a dull, solid sound. Immaturity and poor quality are indicated by a hollow thud. The fruit should be stored at 45 degrees F. or above, but should be stored for no longer than 4 to 6 weeks. Misc. : Fruting can be forced when the plant is mature by using acetlylene gas or a spray of calcium carbide solution (30 gms to 1 gal. water), which produces acetylene. Or calcium carbide (10 - 12 grains) can be deposited in the crown of the plant to be dissolved by rain. A safer and more practical method for home growers is a foliar spray of A-naphthaleneacetic acid (1 gm in 10 gal water) or B-hydroxyethyl hydrazine. The latter is more effective. The plants usually produce for about four years, but they may last longer in California since the life-cycle is slowed down by cooler weather.